AMANALCO DE BECERRA, Mexico (AP) — For years, park rangers and conservationists working around Mexico's Nevado de Toluca volcano chased rumors of a monarch butterfly colony that wintered high in a forest of oyamel firs in some corner of the 132,000-acre (53,419-hectare) national reserve. MEXICO CITY (AP) — The population of monarch butterflies wintering in central Mexico is up 144 percent over last year, experts said Wednesday. IDAHO FALLS, Idaho (AP) — Something catastrophically wrong happened in 2018 to monarch butterflies. 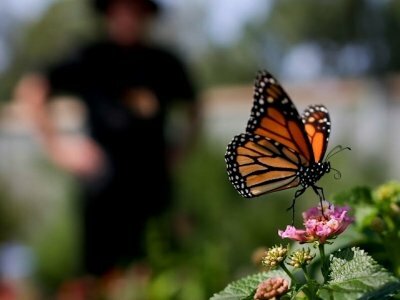 SAN FRANCISCO (AP) — Researchers with an environmental group have labeled as "disturbingly low" the number of western monarch butterflies that migrate along the California coast. GAINESVILLE, Fla. (AP) — New research shows the number of butterflies and caterpillars in North Florida has been declining substantially over the last decade or so. The University of Florida study released this week says the number has declined by 80 percent since 2005. MEXICO CITY (AP) — The first monarch butterflies have arrived at their wintering grounds in the mountains of central Mexico almost a week later than usual, Mexico's Environment Department said Wednesday. Millions of monarchs make the 3,400-mile (5,500-kilometer) migration from the United States and Canada each year. The butterflies usually arrive by Mexico's Nov. 1 Day of the Dead holiday, and local residents long associated their return with the souls of the dead returning to their homes. CAPE MAY, N.J. (AP) — Officials say they counted fewer numbers of monarch butterflies during their annual migration through Cape May in New Jersey this year. MILTON, Wis. (AP) — Last April, Dave Bendlin spotted a monarch in his garden about five weeks ahead of the usual time the butterfly first appears in spring. NORFOLK, Neb. (AP) — The Nebraska Game and Parks Commission is giving away milkweed seedlings to help monarch butterflies. The seedlings, planting instructions and other educational information will be available from 10 a.m. to 1 p.m. Saturday at Game and Parks' Northeast District Office, 2201 N. 13th St.
OGDEN, Utah (AP) — A series of murals depicting the life cycle of a monarch butterfly is taking shape in Ogden. The nationwide Migrating Mural project is the brainchild of artist Jane Kim and her business partner, Thayer Walker, the Standard-Examiner reported . COLUMBUS, Ind. (AP) — A park focusing on plants that attract bees, butterflies and birds is planned for part of a southern Indiana city that saw severe flooding a decade ago. CHAMBERSBURG, Pa. (AP) — Vonnie Black follows the erratic first flight of a monarch butterfly. She smiles. She's seen it hundreds of times. "They are just so amazing," Black said. The great grandmother has been raising the orange and black butterflies for more than 20 years from her home in Hamilton Township. STAUNTON, Va. (AP) — The Bergland family are enjoying a delightful experience this summer. After planting milkweeds in their garden and watching caterpillars feast, dozens of monarch butterfly chrysalises now line their home, porch and fence that surround their property in Staunton. KINGSLEY, Mich. (AP) — Officials in northern Michigan are working to get rid of an invasive plant that poisons monarch butterflies. ALTOONA, Wis. (AP) — What started as a joke has become a 10-year hobby for an Eau Claire woman. "I made fun of a friend for doing this. Ironically, I am now doing it," Kris Gessert said of raising monarchs, as she released a butterfly out of the cage it was raised in and into the wider world. —The migratory monarch population that overwinters in central Mexico from eastern Canada and the U.S. declined 84 percent between 1997 and 2014. A similar decline was observed for the smaller population of migrating Western monarchs that winter in California. QUEBEC CITY (AP) — For generations, North American farmers have despised milkweed and done their best to rid their lands of it. "I hate to have milkweed in my strawberry field," Nathalie Leonard says from her farm by the Quebec village of Lac-du-Cerf. KEY LARGO, Fla. (AP) — For the first time in almost a decade, a rare and endangered butterfly is flying in the main stretch of the Florida Keys, once again defying the hurricanes and habitat loss that had brought it to the brink of extinction. NORFOLK, Va. (AP) — Lincoln Brower, who was considered one of the foremost experts on the iconic monarch butterfly and a scientist who advocated for the declining species' protection, has died. He was 86. Linda Fink, his wife, confirmed Friday that Brower passed away Tuesday at home in Nelson County, Virginia, after a long illness. Brower studied the orange-and-black-winged insect for more than six decades. It is famous for its epic migration each year. ASTORIA, Ore. (AP) — Rare butterfly caterpillars have returned to the slopes of Saddle Mountain in the Oregon Coast Range. The Daily Astorian reports 500 Oregon silverspot caterpillars have been released there as part of an effort to rebuild the threatened butterfly's population at key sites. GREELEY, Colo. (AP) — The Colorado Department of Transportation is working to make a stretch of interstate from Denver to Nebraska friendlier for bees and butterflies. KENNEWICK, Wash. (AP) — The question of where Mid-Columbia monarch butterflies migrate in the West isn't a question anymore, thanks to a Prosser researcher. With new information from a five-year study, WSU professor David James has advice for how area residents can help save the declining population. James' study of about 15,000 monarch butterflies had no research money, so he relied on volunteer "citizen scientists" and inmates at the Washington State Penitentiary in Walla Walla for help. CINCINNATI (AP) — A woman who took a dead butterfly from an Ohio botanical garden has pleaded guilty to misdemeanor theft. MUSCATINE, Iowa (AP) — Officials and volunteers in eastern Iowa have opened a park on a former vacant lot with hopes of increasing habitat for bees, butterflies and other insects and demonstrating the importance of such efforts. LANSING, Mich. (AP) — Public comment is being sought on a draft of a conservation plan expected to help reverse eastern monarch butterfly population declines. Michigan's Department of Natural Resources says the Mid-America Monarch Conservation Strategy builds on existing efforts by state, federal, and local agencies and private organizations and individuals. ORLANDO, Fla. (AP) — Efforts are underway in Central Florida to restore the habitats of the monarch butterfly, crucial to helping plants grow, including many foods people eat. The iconic orange and black insect is one of nature's key pollinators. Environmentalists say its decline, which they blame in part on climate change, threatens the ecological health of the region, and other crucial insects may be suffering as well. 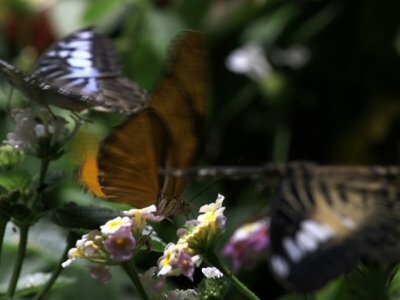 CINCINNATI (AP) — Police say a woman who stole a butterfly from an Ohio botanical garden exhibit has been arrested. The Cincinnati Enquirer reports Springfield Township police on Friday arrested 36-year-old Jamie Revis, of Springfield Township. She's charged with theft for stealing a blue morpho butterfly from Krohn Conservatory in Cincinnati two weeks ago. The birds and the bees and the flowers in the trees and the humans moving among them are all part of the web of life. “Pull one thread and it shakes the entire system,” said Lisa Teroczi of Earth Tones nursery in Woodbury, which specializes in selling native plants. Teroczi spoke last week at the Ridgefield Library during a meeting to launch a manifestation of that interconnectedness — the town’s Pollinator Pathway. The Saturday Club held its monthly meeting Wednesday at the Watertown Country Club. Dodge County Master Gardener Gae Bergmann spoke to the group about monarch butterflies, which she has raised and studied for years. The Foellinger-Freimann Botanical Conservatory's newest residents aren't shy. To the delight of many visitors Sunday, the residents : recently hatched butterflies of varying exotic species : perched on children's and adults' noses, fingers and arms, often remaining still for photographs. "They'll come to you," said Tom Hegge, a supervisor at the Botanical Conservatory. McALLEN, Texas – A little-known Eden situated along the Mexican border has long been a favorite destination of birders and nature lovers seeking warmth during the winter and spectacular species found nowhere else in the United States. The U.S. Fish & Wildlife Service has proposed listing the island marble butterfly, which is found only on San Juan Island, as an endangered species. Since a state biologist discovered the butterfly fluttering across a field on San Juan Island in 1998, several efforts have been made to protect it and prevent the species from disappearing. Nature lovers of all ages are invited to a family-friendly "Butterfly Celebration" hosted by the Fort Bend County Master Gardeners on Saturday, May 5, from 9 a.m. until noon in the Master Gardeners Demonstration Gardens in Rosenberg. With our recent string of warm weather, we gardeners are busy dreaming about the growing season to come. We can't wait to get our hands in the soil again and grow something beautiful. McALLEN – Families swarmed to the Quinta Mazatlán World Birding Center for the Monarch Festival on Saturday to celebrate the northern migration of the iconic butterfly. Taking place throughout the birding grounds and the historic adobe home, people from across the Rio Grande Valley arrived on the sunny day faced with a human-sized orange monarch at the entrance before making their way into the grounds. "Everyone loves butterflies. Not even a politician can say 'I hate butterflies,'" Friends of the Kankakee President Marianne Hahn said at FOK's annual meeting Saturday. She was introducing Mike Jeffords and Susan Post -- the animated guest speakers whose love for butterflies has spanned decades as Illinois Natural History Survey entomologists and partners in marriage for 35 years. DES MOINES, Iowa (AP) — Iowa officials have set new goals for monarch butterfly habitat to help keep the insect from being listed as an endangered species. The Iowa Department of Agriculture and Iowa Department of Natural Resources wants to have 480,000 to 830,000 acres of habitat across the state. That's room for about 127 million to 188 million new milkweed stems, which is the only plant monarch butterflies lay their eggs on. The goal: plant about double Iowa's estimated amount of milkweed. Many of the Sunset View Elementary kindergarteners who experienced the new butterfly exhibit at the Loveland Living Planet Aquarium on Wednesday entered the enclosure with trepidation or enthusiasm, but exited in awe. Chris Jenkins is the one who was thrilled about a butterfly landing on his shirt. Ridger Shoell and Gael Flores were just excited about a Pink Lady butterfly landing on their finger. Ronin Taylor just enjoyed watching the butterflies flit around him. MEXICO CITY (AP) — The number of monarch butterflies wintering in Mexican forests declined for a second consecutive year, a government official said Monday. Alejandro Del Mazo, Mexico's commissioner for protected areas, said the monarchs clumped in trees covering about 6.12 acres (2.48 hectares) this winter. That was down about 14.7 percent from the 7.19 acres (2.91 hectares) the previous winter.